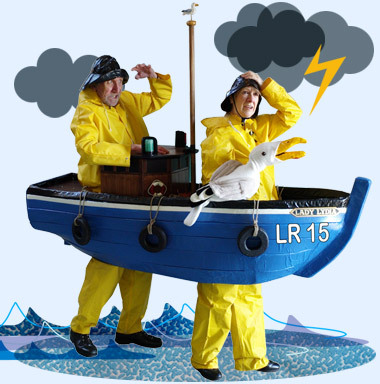 Andy Andrews and Christine Bissell are INNER STATE ... A comedy double act who work hard but are the most relaxed performers around. Andy Andrews and Christine Bissell are INNER STATE ... as usual ! A comedy double act who work hard but are the most relaxed performers around - even after working together for nearly a quarter of a century. Seasoned performers who always look like they're having a great time and are an asset to any event. Audience participation is a vital part of the act, whether they are doing a theatre show, playing music, or attempting to mix and mingle with the crowd. They claim that they can cope with anything ... except silence! 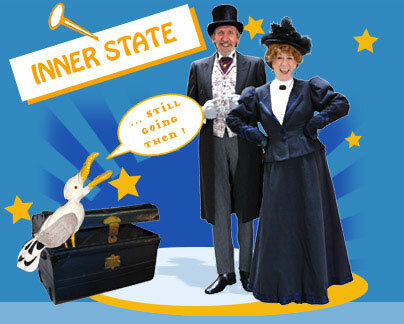 Inner State is well known at maritime events around the country and has a variety of suitable acts, barmy characters and promenading boats for you. There is now a dockyard of boats from which you can choose the most suitable for your event. 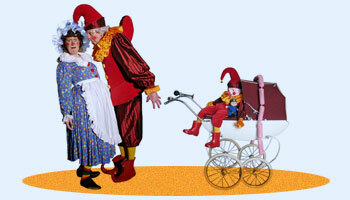 The two characters aboard are slightly unhinged and accompanied by a puppet ready to amuse the children and insult the adults. Meet Punch and Judy out for a promenade, or settle down to watch a jolly seaside show with songs, or maybe ferocious pirates. In the tradition of British comedy, Inner State is skilled in taking an irreverent look at our illustrious and sometimes disastrous history. Nothing is spared! Interactive characters, often accompanied by a loud, bad tempered puppet. Suitable for various themes and historical periods. Two very fetching hobby horses, with a variety of riders to suit specific themes. Comic sketches, with a smattering of song, audience participation and general chaos. Surprisingly informative, if you can separate the facts from the nonsense. What Did You Do In The War, Harry? Our two spivs do their bit for the war effort. New versions of Charles Dickens’ famous stories, in authentic costume, using puppets and a narrator. 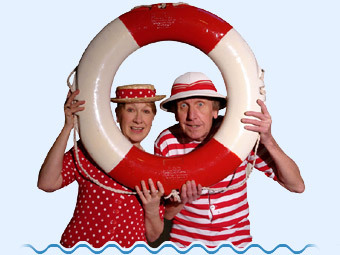 Full length comedy shows for village halls, community centres and arts centres. An evening of stupidity with music ...so not for the 'high-brow'! 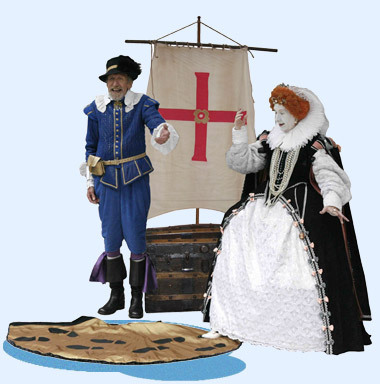 ... if you're organising an event with a specific theme, or set in a particular historic period try the following links as well, to see what's on offer. Currently undergoing renovation but should be available soon. A very long term project, as it's turned out! Highly suitable for classic car shows, transport museums, and WWII or 1950's themed events.